How Is End-of-Life E-Waste Tonnage Reincarnated in Neighboring States? In 2009, I wrote a blog about e-waste "Ghost Tonnage" in state mandated CRT and e-Waste Recycling Programs. A trade publication spotted it and asked to re-run it. I declined, as the causes and effects were a little confused at that point. This was not a simple case of Kramer driving New York deposit bottles to Michigan. Unfortunately, "fraud" is not particularly rare in recycling businesses. Yesterday's post about the conviction of the Colorado "Executive" company is not the largest. The Sacramento Bee had a front page story about Arizona recyclers turning TVs into California for "redemption",using CA addresses "freed up" by exporting monitors for reuse against SB20 terms. A new report by Lauren Roman of Transparent Planet (my company is one of ten sponsors) scratches the surface of ewaste funding conspiracy theories, about stockpiled CRT glass, and market capacity for the glass. (I only had 48 hours to comment but Lauren has promised it's a "living document". I will make a separate blog to crib the report... it's good in a glasnosty way to start the discussion, but bears the fingerprints of agendas, and some of the people NOT interviewed in the report will need a chance to respond to "stockpiling" accusations). A recycler who declares an abandoned car ("A-Waste") to be "covered electronics" in a state program (it may have a radio and electronics, after all) certainly gets a lot of pounds in a short time, and can sell those tons to an OEM rather cheaply. And a recycler who turns a ton of TVs for reimbursement by two different OEM sponsors has doubled not just his profits, but his entire revenue. Clearly, anyone getting paid twice for the same recycling, or claiming auto scrap as a "covered device", plays mumblety peg with mug shot photographers. 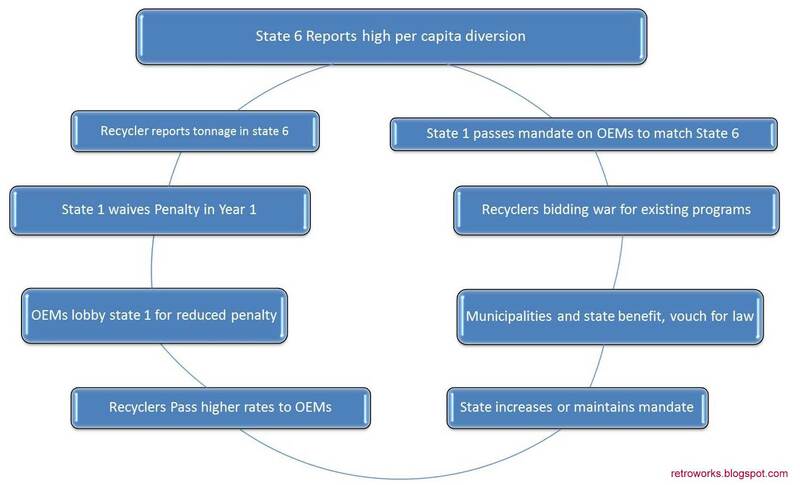 The OEM may appear complicit in accepting cheap tons to meet a state stewardship mandate. Because the volumes are so high, recyclers are forced to partner with consolidators, takebacks, and haulers - no recycler can get 10 million pounds directly from consumers and residents. My company cleaned up abandoned TVs from the sides of roads in Rhode Island, "green up" days in Vermont, and abandoned lots in Massachusetts... can we know for sure? California is a state run program. But in the Stewardship Programs discussed in Lauren's report (she omits Massachusetts because the law came from executive branch order rather than legislation, even though MA has stockpiled glass) the state has created the obligation for the OEM to pick up a specific number of devices from homeowners in the state - a numbe derived via... some kind of state employee number crunching... the ouija board tells OEMs how many TVs and computers they need to fetch, or pay fines for. So the manufacturer in faraway Asia is given a specific number of pounds of electronics they must "get recycled" in Minnesota. A number that is not even in metrics. And if they don't pick up that number, they pay a fine. Which recycler do we expect them to choose - one who is cheap and has "lots" of pounds, or one who is expensive and struggles to avoid the fine? While I'm still on the topic of Environmental Malpractice, let me make the comment that I've never defended the Colorado firm, Executive Recycling, which was nailed by CBS 60 Minutes. It's called a "straw man" fallacy. BAN accuses me of supporting a liar, in order to discredit my defense of the truthful person. I never defended Richter, I did the opposite. But I defended people buying the monitors that he didn't send, the ones BAN circled in Hong Kong. What Brandon Richter of CBS Wasteland did was to claim that Chinese were filthy bad recyclers and that people who used his company would know that he didn't export their stuff to China. He was on the BAN WAGON. He advertised that he didn't export to China, and represented China as a primitive place. He was found guilty of FRAUD. Early in 2012, I wrote about the "pixelized slums" in Lima Peru, from the inside, and showed the OECD slums (Mexico, Japan) from the satellite beside the non-OECD slums in Delhi (Useless Lists of Jobs Beneath Wealthy People). In its expose on Nairobi (where Fair Trade Recycling sent 3 representatives to a UNEP conference last March), the Economist gives readers a taste of entrepreneurism, rich and salty, in the free markets of Africa's largest shantytown. "Upwardly Mobile Africa: Boomtown Slum"has incredible photos by Piers Benatar/Panos, taking us inside "a day in the economic life of Africa's biggest shanty-town." 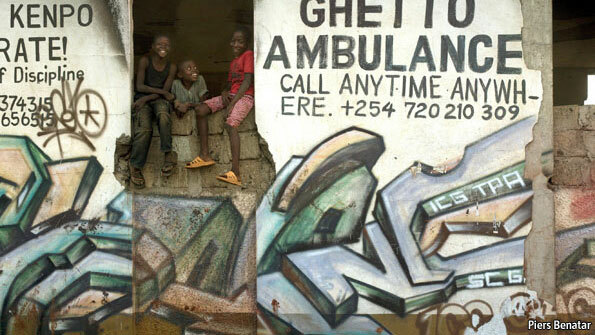 It's easy to take a photo in a tough part of town and use it to simplify a continent. The Economist takes lots of different photos, not seeking to prove an a priori angle, but to bring us closer to understanding the complex. We covered a lot of ground (somewhat laboriously) during the past 4 weeks, basically making the case for two serious "environmental malpractice" cases. 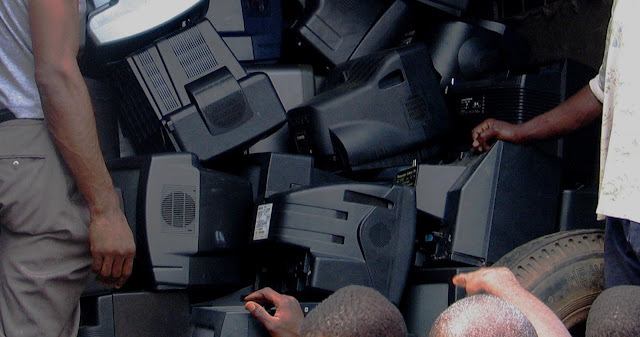 Do the poorest people in emerging markets have all the tools and safety protections they need to recycle bad CRTs? No. That is the point of Fair Trade Recycling. Use the value of the proven 85% good material to pay for the proper recycling - not just of the 15% accidental breakage and elective upgrade, but also the electronics being thrown out today in those nations. Fair Trade Recycling depends on the use of the reuse market to finance these improvements. But we must overcome an effective boycott on trade with poor people. In the past few posts on Environmental Justice, I've shown current news stories (within the past 6 months) about technicians framed, outed, and defamed for their reuse and repair work in ICT industries. Here's a synopsis of the first two cases (already posted) and a teaser on Environmental Malpractice 7. This is not OLD NEWS. This defamation is in the headlines today. 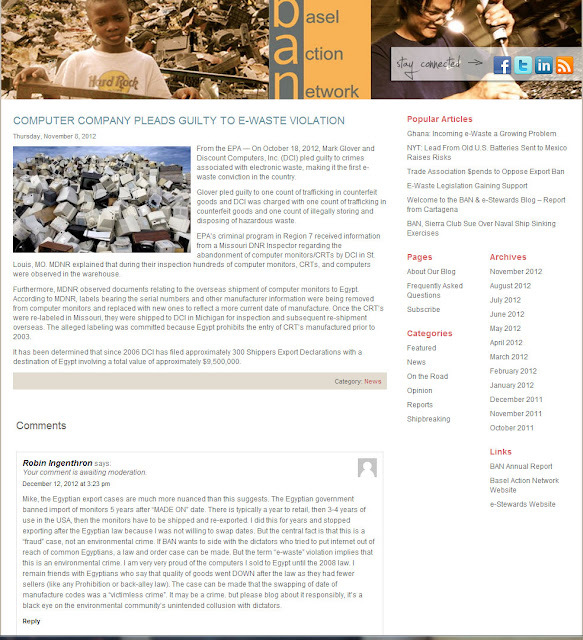 - Egypt: The false statements by BAN (cited in EM5) give an excuse to a regime to seize computers more than 5 years after date of manufacture - including CRTs that last 25 years - as "e-waste". The timing of enforcement, 2007, meant there were virtually no CRTs with assembly line dates of 2003 to be found, and 100% of CRTs were seized by Egyptian customs during the next few years. This led to a 2011 Report on "E-Waste Disposal Problems" in Egypt, which is cited (temporally wrong) as support for BAN's original claim. But the report dealt exclusively with the "problem" of the pile of working CRTs seized by customs - a completely Ban-made problem. It culminates with three things: an end to sales by reputable USA suppliers, an arrest of USA suppliers willing to tape fake dates on the monitors, and the Egypt market finally accepting cheap new units made in China, the end of a decade when names like "IBM" and "HP" and "Dell" meant a quality, affordable, internet experience in Cairo. A November 2012 Headline on Egypt shows a massive pile of mixed TVs and monitor "ewaste" dumped on the ground. Egyptian Geeks are out of business. #Hamdy. - Nigeria and Ghana: The false statements by BAN (cited in EM6), especially the "80%-90% of African = primitive" statistic completely made up off the top of someone's head, leads to a ban on exports by European WEEE standards. Africans try buying, as they did the previous decade, newish and tested CRTs. Greenpeace and the UK Independent sneak a sabotaged TV into Joseph Benson's container with a GPS, and track it. Benson is arrested and goods are seized. But a 2 year research by UNEP finds that 85% of the imports are working, and that a similar percentage of material at the Agbogbloshie and other dumps were trade ins and discards from African cities (which had TV since the 1980s). December 2012 Headline: Joseph Benson found guilty of exporting, implied to be a vindication of the 80% primitive African propaganda, and no mention of the UNEP 2011 studies discrediting the original accusation. West African Geeks are out of business. #Benson. In the final section, Indonesia (Environmental Malpractice 7, currently editing), we have the absolutely worst example of Environmental Malpractice and Injustice. In the two cases above, rich corporations protected their new sales from "secondary markets" by funding an NGO who targets up and coming threats in emerging markets (which were growing in internet use at 10X the rate of the USA and Europe). This week's headline repeats the fake, false, discredited, unsupported, undocumented, predjudiced statistic - in Science Daily, a magazine likely to be cited as a source by future "e-waste" researchers. Aggravated against the profiling, arrest, and then defamation of 3 cases of Geeks of Color... Just as I went to check on BAN.org's coverage of the Joseph Benson (Env Malpractice 7) case, I found this gem about similar USA arrest of "E-waste Criminals". It's another digression from the Final Environmental Malpractice case study of the Indonesian reuse plant. Here is the entire discussion between Mike Enberg of BAN and I, using their blog... assuming my comment below isn't "moderated" away. Revised based on contact from Benson's associate, following the Vermont Fair Trade Recycling Summit 2013.04.16. Subsequent to my last post, about the arrest of "Hurricane Carter" (Joseph Benson), the UK agency @EnvAgency and newspaper reporter, Cahal Milmo (@CahalMilmo), of the Independent @Independent, released this news that Benson has just settled his plea, three years later, after unsuccessful appeals taken through the court system. The UK Independent reporter Milmo and UK Environmental Crimes units seem to absolutely crow over the Eleven thousand British pound settlement (about $23,000), sending tweets and photos. If Benson was interviewed, they don't use it. Anyone in business knows that the cost of hiring a lawyer and running appeals was far, far more than the 11K plea settlement. I have not spoken to or dealt with Mr. Benson, but my suspicion is that it's evidence he wanted to clear his intentions and good name with this long appeal. Should I be going out on a limb for someone who has just accepted a financial settlement guilty plea ? Benson's associate insists this is not a "guilty" plea, and that they expect the funds to return when Benson is exonerated. Hurricane Benson was publicly accused (@Guardian as well as @Independent) in 2009 of primarily exporting TVs and electronics for primitive wire burning; David Fedele, Pieter Hugo, and others take film of African dumps and tie it primarily to men and women like Mr. Benson. That is thanks to one person: Jim Puckett of Seattle Washington, who has told everyone in the world that the scrap burned in Agbogbloshie and Guiyu is a "dirty little secret", that it comes from wealthy nations recycling programs. I put a lot of photos around the first false arrest - Medicom of Egypt, 2008 (prior post). Jim Puckett's quotations framing the discussion of Egyptian imports, to the Arab magazine, put Basel Action Network's fingerprints on the smoking gun of "e-waste enforcement" to muzzle affordable electronics used by the students behind the Arab Spring. The second framing victim is the Nigeria's "Hurricane Carter", Joseph Benson. I don't have pictures. But since Jim was kind enough to give me credit at the E-Waste Summit in Las Vegas three weeks ago, for having led him to Lagos, and since he was good enough to put the newspaper articles about the arrest of Mr. Benson into his presentation, and to quote Emile Lindemulder's Interpol report implying Mr. Benson's activities were "organized crime"... I will use one of his, in "fair use". In showing the photo below at the Vegas conference, and giving me credit for his being here, I have the right to rebut the "dirty little secret" Puckett says this photo is evidence of. He thought his photo was evidence that Mr. Benson's arrest, which he showed news coverage of, was environmental justice. Except for one thing - the only thing we see Mr. Benson was "guilty" of is recycling while black. These are all uniform. They are the type of small TV that are popular in slums, where people have electricity, have broadcast TV, but don't have big living rooms. The market for this size of TV is so large that entire factories are devoted to transform used computer monitors to manufacture this specific size of television. They represent less than 5% of the material that comes to Good Point Recycling. This is not random as is television e-waste. This material made its arrival on African shores just some days earlier as cargo inside 40-foot intermodal corrugated containers — the shifting bricks of globalized trade turned techno-trash haulers. Around 400 of these, each containing about 600 computers or monitors arrive each month at the Port of Tema, Ghana, from the UK, USA, Canada and countless other rich and developed countries. They may find a quick stay on the floors and shelves of hundreds of second-hand markets throughout Accra. But those that do not sell — about half, even if they work perfectly —are then picked up by small boys pushing heavy carts and hauled several miles to the outskirts of town, to be thrown away — to Agbogbloshie’s scavengers. About half... even if they work perfectly. An amazing claim. It means that even if Joseph Benson did test them, as he claimed, that the "crime" of exporting used TVs to be burned by dirty little children, is one Benson was guilty of. No matter that Benson paid for transport, paid for TVs, paid for labor, he was willing to lose money, it seems, just to make e-waste recycling in England... fail. Look, here's another container being unloaded, filmed by Greenpeace, which took Jim's 2005 visit and improved on it by tracking Joseph Benson's container to Lagos. They sabotaged a black TV, put a GPS tracker in it, gave it to Benson's people, and PROVED that this was e-Waste! [APPLAUSE] This was the "sting" at the front and center of the UK Independent and Guardian articles Jim Puckett referred to in his Powerpoint. This is part 5 of a series on the impacts of "E-Stewardship" and "Watchdog" campaigns in support of a boycott of 6 billion people (the "non-OECD"). - Part 3: "Collateral Damage"
ARE YOU ASHAMED OF TRADING WITH GEEKS OF COLOR? I'm not. Each of these companies suffered a massive trauma from seizures of used electronics they had purchased, tested for the specifications they gave the seller. In each case, they accepted a narrow lot of material - TVs of a specific size with RCA plugs, working CRT monitors for direct reuse, or CRTs of a certain size and model which could be remanufactured by a factory which used to make them. They paid and arranged shipping, and paid about 10 times the value the items would have as scrap. In each case, they were tried and convicted in the western press based on the "primitive" associations made by Basel Action Network. False assumptions abou exports from rich countries (the ones with nice stuff), and photos of the domestic generation of "e-waste" in their own nations, were enough for the western press to cover the story without interviewing any of these men about their own "crimes". 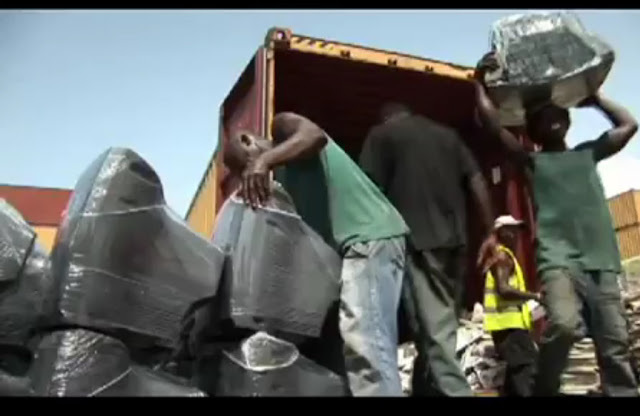 The headline that the used electronics were "exported" made these men "e-waste criminals". BANimplied that the junk on the ground was the same that these three men imported. It was not. And Interpol believed BAN, and wrote that (because the sale was "organized") that this was evidence of "organized crime". And no American or European reporter has called ANY of these men to get their side of the "e-Waste" story. Now universities, like University of Washington, are being asked to "sign up" and show pride in a boycott which would make Senator Joe McCarthy blush. We need Bob Dylan to write another "Hurricane" song. "According to recent statistics, the number of Egyptians using the internet increased 39 percent to 13.5 million between 2008 and 2009, and the number of people who owned a mobile phone went from 30 million to 48 million in the same period. The repair industry has no doubt played an important role in making such technologies available to those Egyptians on the lowest wages." Jim Puckett says "a lot". In the past, he was more specific. The BAN estimate peaked at "Eighty to ninety percent"... Basel Action Network was circulating bad estimates to the press for a decade. BAN knows next to nothing about Medi-Com or other importers in Egypt. "Eighty percent of interracial marriages end in abuse and divorce". Imagine that totally fictious, alarmist, made up statisic... It would be an outrage.